The explosion of floral diversity within a relatively short evolutionary time – about 150 million years since the origin of flowering plants – has puzzled botanists and evolutionary biologists alike. But as much as they vary, flowers are generally made of four basic types of organs that appear in the same order: starting from the outside, the sepals and petals (which are often the showy parts of a flower) surround the stamens (male reproductive organs), which in turn encircle the carpels (female reproductive organs). How can the genes that control flower development be so conserved as to ensure this common, basic structure, and yet be flexible enough to allow for the wide diversity of floral form? 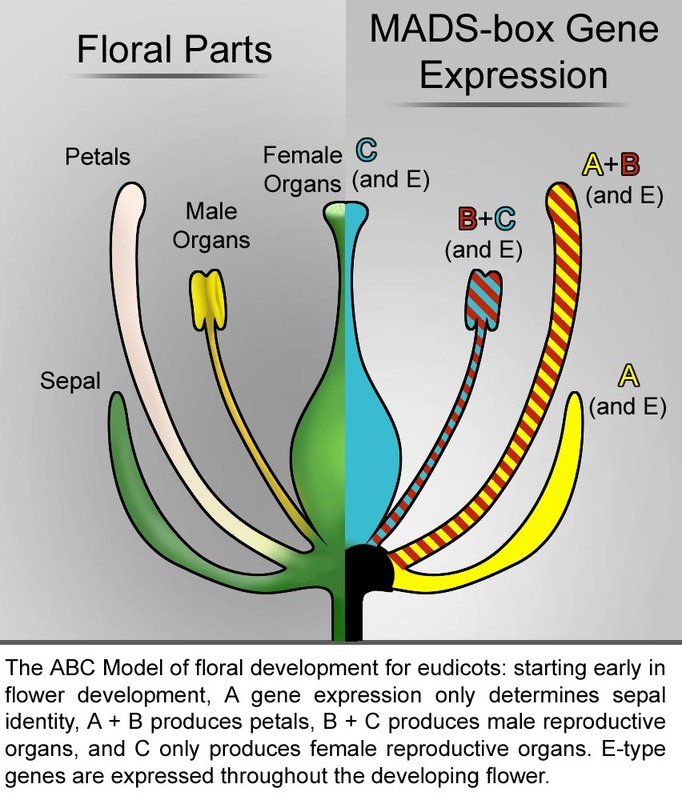 The MADS box genes, major players during flower development, orchestrate what is known as the ABC model, illustrated below. It goes like this: very early in flower development, each of the physical positions for a floral organ will have their developmental fate determined by what combination of the A-, B-, or C-type MADS box genes are expressed there. If only the A-type genes are expressed, then a sepal will be produced. Expression of A and B genes produces petals, B and C genes produce stamens, and C-gene only expression leads to carpel development. Shifts in where the A, B, and C genes are expressed lead to the production of different floral organs. However, the A, B, and C genes are not sufficient to determine organ identity by themselves – in order to interact with each other and actually carry out their functions within the cell, the proteins that they code for need to bind with proteins coded for by the E-type genes (which are divided into two groups named SEP and AGL6). What to learn more about MADS-box genes and flower development? Check out this article! This ABC model was originally built with information from one major group of the land plants – the eudicots (a large and diverse group that includes sunflowers, tomatoes, roses, and oak trees). However, the application of this model to the other major group, the monocots (grasses, palm trees, and tulips, just to name a few), has been tricky. 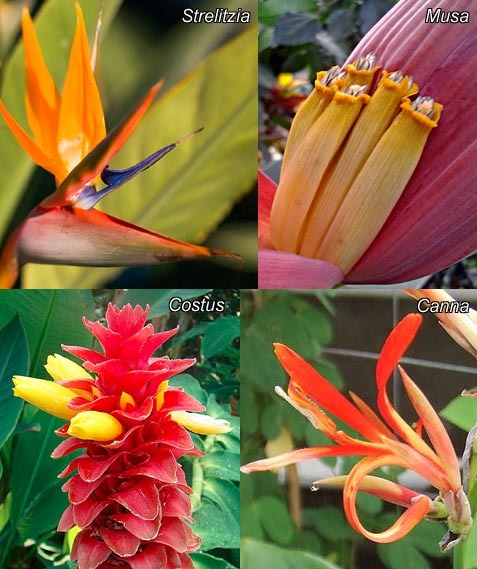 One lineage within the monocots has been particularly intriguing, given how different their flowers are – Zingiberales, the order that includes bananas and ginger. The most ancient lineage of Zingiberales has the fewest types of floral organs – even the sepals and petals cannot not be readily distinguished, and together form a tube. However, in more derived Zingiberales species (species that split from their cousins most recently), there are more types of floral organs, allowing for more complex flower shapes. Flowers in the Zingiberles are particularly varied and diverse, possibly because of the duplication of the E-type genes. Images by Becky Povilus or via Wikimedia Commons. Have changes in the functions or expression patterns of the MADS box genes caused changes in the identity of floral organs within Zingiberales, or is some other mechanism at work? Yockteng et al. 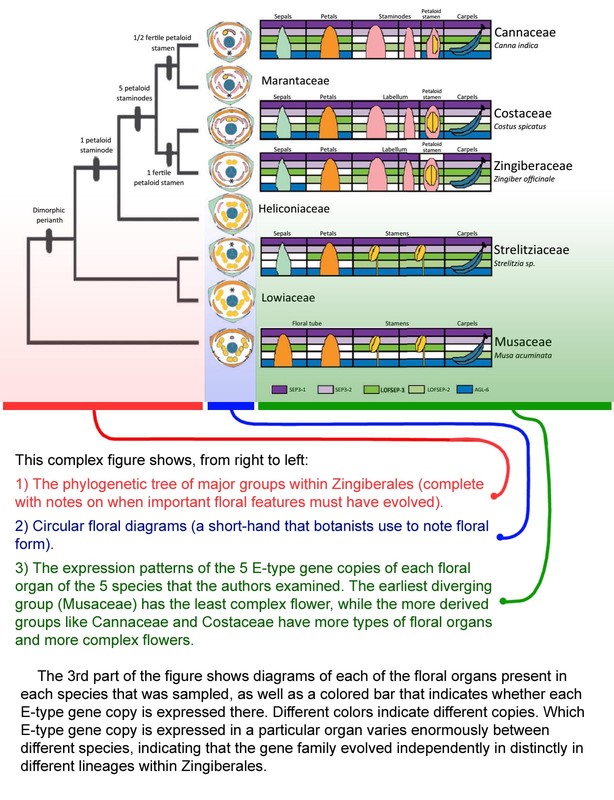 (2013) hypothesize that the evolution of complex flowers with novel organ types in this group has been due to an increase in the number of E-type MADS box genes and their subsequent differentiation. This hypothesis addresses a common theme in molecular evolution: a gene that performs one or more essential functions will evolve slowly since it can’t tolerate a build-up of mutations without failing – often resulting in fatal consequences. However, if there are multiple copies of that gene, then the functions of the gene can be split up among the copies and/or the “extra” copies will be free to evolve – as long as at least one copy is performing the original functions. Want to learn about how genes can be duplicated, and what can happen to them afterwards? Check out this article! Intriguingly, the E-type genes display distinct expression patterns for each organ of each species. This means that, rather than showing a single clear evolutionary trajectory within the group, the collection of E-types genes within each family has its own distinct evolutionary history. Ultimately, this study supports the idea that having more copies of a gene can allow for production of more complex forms while still maintaining the integrity of an essential developmental program. Simply put, flowers can get fancier over time if they have the genes to spare! Becky Povilus is a PhD Student in the department of Organismic and Evolutionary Biology at Harvard University.